But alas, I came across something interesting in today's West Australian newspaper, and thought I'd share it with you all. So what's so interesting? Well it's the origin of the phrase "Goody-Two-Shoes". Not that it's a phrase I use, but it's one that's been used for a long time, since 1765 actually...so for anyone who's interested, here's the story behind it. Goody-two-shoes is taken from a children's story, created in 1765 by Oliver Goldsmith. The original title of the story? The History of Little Goody Two-Shoes, otherwise called Mrs Marjorie Twoshoes, with the Means by Which She Acquired Her Learning and Wisdom, and in Consequence Therof Her Estate; Set Forth At Large for the Benefit of Those Who From a State of Rags and Care and Having Shoes But Half a pair; Their Fortune and Their Fame Would Fix, and Gallop in a Coach and Six. SERIOUSLY!!! Imagine trying to market a book with that title! Anyway, the story's main character is a poor child who only owns one shoe, but for being good, she was given a pair of new shoes. Her joy knew no bounds and she proudly showed them off to all and sundry, telling everyone she had "two shoes". In time, she acquired knowledge and became very wealthy...in other words she became smug. So, that's how "good but smug" people came to be refered to as "a little goody-two-shoes". Who needs a shoe picture when there is George Clooney in the world? That's an interesting story - it's funny to think that behind every cliched phrase there's an origin. I look forward to reading your blog too! i never knew that story thank you for sharing. 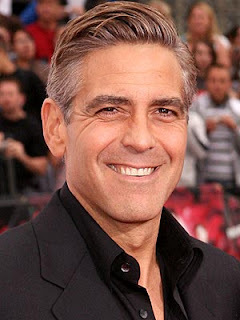 Oh george looks good but I don't like his hair in that picture. Glad he's single again, gives the rest of us hope!